The “buzz word” of today’s workforce is work-life balance. It is not that employees in 2017 don’t work hard, in fact it is much the opposite. Today’s workers have simply learned that it is equally as important to take time for yourself and your family. But sometimes we forget. A few weeks ago, we had the opportunity to attend The Global Leadership Summit. If you have the opportunity to attend this or another leadership conference – do it. Or send your staff. 6:00 – Wake up and take a quick look at emails. 6:05 – Get myself dressed. At the same time get all four kids up, dressed, fed, do homework (that was forgotten the night before), argue with the 9-year-old about why brushing his teeth is important, convince the 6-year-old that taking every Barbie she owns to school is not an option, get the 8-year-old to put down his tablet long enough to get dressed, get the 2-year-old who is potty training dressed a second time because she already had one “oopsie” for the day. Field an occasional call from a client or call the printer about a project in the print queue for the day. 8:10 – Get the older kids out the door and on the bus. 8:15 – Take the 2-year-old to daycare. While in transit make calls to team members, clients or vendors. 5:45 – Leave the office, run home make dinner, feed kids, get a rundown on the day’s activities and a preview of the next from my husband who works an early morning shift, help with homework while checking email and finishing a project on a tight deadline, spend the next three hours convincing aforementioned children to go to bed and SLEEP! 10:00 – Collapse watching some mindless television show while trying to complete one thing from the to do list so it’s a bit shorter in the morning (who am I kidding – ha) and check my email one last time. So maybe you aren’t dealing with four kids and a full-time job. Or, maybe you are. If not, I am sure you have other endless lists that fill the bookends of your day, leaving no time for yourself. 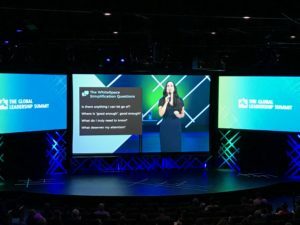 Juliet Funt, one of the accomplished speakers at the Global Leadership Summit, spoke to us about the importance of introducing whitespace into our everyday lives. It is impossible to be effective or creative without it. In the graphic design world, whitespaces are open spaces in a printed or digital piece that allows the viewer’s eyes to take a break. In life, whitespace does the same for our minds. Juliet asked us to “de-crappify” our lives. In short, find those things that can be eliminated. Do you really have to know EVERYTHING about a project? What actually needs your attention? What CAN you let go of? Do you really need to hold an all-staff meeting EVERY DAY??? I left the Global Leadership Summit having learned a lot – about myself and about what I needed to do. The first is to take time to breath. To build whitespace into my day. If you are the boss, build the white space for your employees and yourself. By building in whitespace and giving our minds time to take a break, it gives each of us the opportunity to become creative. You will have less stress and be better at your day to day work. At Epiphany, we specialize in being creative. Whitespace is essential. Perhaps at your organization, creativity abounds in developing innovative ways to serve your clients or customers. Maybe marketing has entered into that black hole of “to dos” that you need to eliminate to allow your mind space to breath. You can’t eliminate marketing, but you can lift the weight. Give us a call to find out how we can help. Anna is a Fundraising Consultant, Graphic/Web Designer, Marketing Strategist, Media Relations Professional and Event Planner. Anna holds a Bachelor of Arts from the University of Iowa with degrees in Journalism and Spanish. Anna and her husband, Sean, live in Cedar Rapids. They have four very energetic kiddos, two boys and two girls. Live or Die by the Online Reviews. You talkin’ to me? I’m talkin’ to you! Libraries are far from irrelevant. to our mailing list to be notified of new marketing resources and opportunities to help you spark your brand promise. Epiphany is based in Marion, Iowa. Our team will come to you. Call Christa at 319-431-9720. Let's chat! © Epiphany – Your Creative Spark, Inc. | All rights reserved. Subscribe to our mailing list to be notified of new marketing resources and opportunities to help you spark your brand promise.